I have had vitiligo since I was 4. I am now 60 and am still spotted; with even less pigmentation (melanin). I tried many cures over the years, because we all know that kids can be cruel. When I was a teenager, I still received many disparaging remarks, but it appeared that boys did not seem to be as bothered, as they thought I was pretty. My advice to you, is to accept the fact that although we have this disease, it isn't as insidious as cancer, schizophrenia, Ebola, polio (my mom had this), diabetes, AIDS, progeria (aging disease), etc. Just wear sunscreen (I need and use lots) and makeup if needed. Maybe one day before we die, they may just find a real cure for our spots! When I was 14 I started developing spots under my arms, I went to the dermatologist and got diagnosed with vitiligo and it just kept spreading. When I was 16 I had to be rushed to the hospital because of my heart rate, and I was diagnosed with Graves' disease the minute they saw my skin and my test results. Whenever I go into the sun my vitiligo burns and spreads. I have it around my eyes and people think I wear white make-up or will ask me what I've done to my eyes. I've realized that some things just make you special and you just have to live with them. If you spend your life wondering why you got this disease, you'll never live the way you should. Look at the positive side, you have something only a select few have. Now I'm 19 and not self-conscious with my body at all because of my spots, I love them and embrace them. I don't let it stop me from wearing my favorite strapless dress or shorts. You have to realize that it's not so much what's on the outside but on the inside. 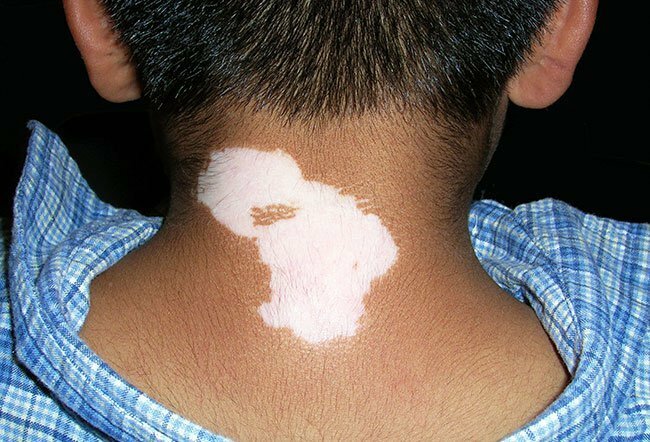 I was first diagnosed with vitiligo at the age of 10. Too young to know what I was in for. I have generalized vitiligo on feet, knees, groin, hips, elbows, hands and chest. You'd think I was a mess. Well, for years I took a drug called Trisoralen and there was improvement over time. Real improvement. Then the drug maker stopped making this medicine and I had nowhere to turn for help. Too expensive to make I was told. Big disappointment! Trisoralen seems to help if you can get out into the sun for UV exposure in concert with the Trisoralen. Anyway, I am 57 now and still deal with this psychologically. Some days are better than others. You must keep a positive attitude and frame of mind. Two people I read about seem to have some success with sunless tanning products you buy over the counter at a retail store. Linda Seidel sells a make up on the web site that others have liked, to mask some areas of vitiligo. Coping with this is not easy. Try to embrace your life and live it. You really only have one life to live and vitiligo will not kill you, but you do need to stay strong, and keep your head up emotionally. Talk with a professional if you are having trouble psychologically or emotionally. I was first diagnosed at age nine and am now 84. At first I had white spots in only a few areas that stayed dormant until my 30s when it started spreading and kept getting worse. After trying everything, my best course was to stay out of the sun to keep my natural pigment from tanning to avoid a strong contrast. It was difficult because I loved the beach and boating. However, staying out of the sun was a blessing in disguise. People usually guess my age to be 65 or 70 and refer to my skin as "beautiful". My advice is to not fight it and just accept it. I have had vitiligo since I was 13 years of age. I am now 40 years old. It started in the private area and moved down my legs and throughout my body. It made me look like a leopard. Now my entire body is covered and it is in my hair as well. Once people get to know you they stop staring. I just want to tell the people reading this and going through this is not to be depressed about it. Go outside, go swimming, go to the movies or out to dinner. Life is too short to worry about everyone staring at you! You didn't do this to yourself so don't be embarrassed for who you are. I did that for way too long. Some of you are in your 20s don't make this condition hold you back! Thanks for listening and I hope this helps at least one of you. I am looking a good make up person who could help me learn to put on makeup to cover vitiligo. I'm a 44 year old male so this is kind of embarrassing. I was diagnosed with vitiligo by a dermatologist. He also told me I had Graves' disease, anyhow my vitiligo is on my face hands and feet and arms. If I get a scratch or a cut, after it heels my skin then turns white. I am Portuguese and German so my skin is a little darker than average. So I try to wear highest sun screen I can find. But it is still very noticeable. Once I was eating at a restaurant and at the table next to us a little girl said to her mom, “look mom, that lady doesn't wash her arms, look how dirty they are.” That just broke my heart so ever since then I try not to be out in public and I won't wear shorts or anything that shows too much skin. I hate this skin disorder but what can you do but live on. I was a sun goddess in my teens and early 20s. However, I tan easily. I started getting vitiligo five years ago. My husband retired from the Mayo Clinic and suggested that I use undiluted Selsun Blue shampoo on my arms where the vitiligo is. It works! I put a small amount of this shampoo in my hand, add a tiny amount of water, and rub it on my arms for overnight treatment. Meanwhile, I cover my arms when out in the sun, as I live in Scottsdale, AZ. By doing this treatment, my vitiligo is gone in a week!